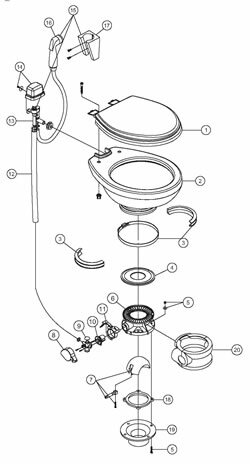 DOMETIC/SEALAND - Gravity Traveler Toilet Parts - 111 Traveler Lite Parts - Page 1 - Environmental Marine Services, Inc. This Kit can be used with any foot operated toilet that has a metal flush rod covered by a plastic pedal cover. Replacement seat and cover for 111, 110 and 210 toilets (bone). For this seat in white it would be part number 385344088. Replacement seat and cover for 111, 110 and 210 toilets (white). For this seat in bone color it would be part number 385344089.